Department of Rheumatology, Endocrinology and Nephrology, which is also known as Internal Medicine II, was established from 1923 (Taishō 12, Japanese calendar) in Hokkaido University. We, as one part of the Internal Medicine Divisions, have been responsible for research and clinical practice. Currently, Internal Medicine II comprises the following research groups: rheumatology, endocrinology and nephrology. 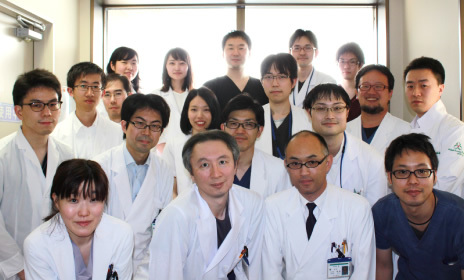 We are also in charge of clinical practice in these fields in Hokkaido University Hospital. Internal Medicine II was established from 1923 (Taishō 12, Japanese calendar) and clinical/research groups began in the era of Professor Torii in 1955 (Shōwa 30, Japanese calendar). Each group has continuously cooperated with each other for a variety of clinical or research topics. 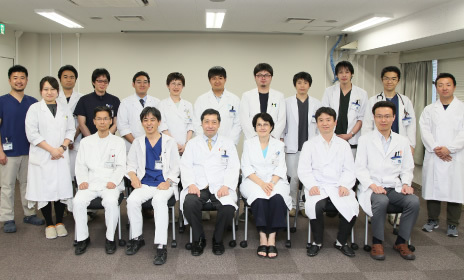 Currently, Tatsuya Atsumi, who has become the sixth Professor since 2012 (Heisei 24, Japanese calendar), aims to work on research to elucidate the pathogenesis and to establish appropriate treatment protocols for diseases related to the rheumatology, endocrinology and nephrology medical fields. 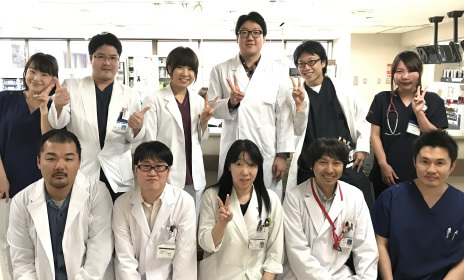 Internal Medicine II, which is also known as “Ninai” since the era of Taishō (meaning Department of Medicine II in Japanese), has been dedicated to research, education and clinical practice in three specialized subunits, rheumatology, endocrinology and nephrology. The three subunits work independently, but also join forces with each other in clinical and research fields. As our slogan, “Be global!”, our department aimed to upskill the scientific insights of clinicians. ‘Is it necessary research for physicians?’ The answer is ‘Yes’. If physicians do not understand how to create evidence-based medicine, even a published article in The New England Journal of Medicine could be misinterpreted. One can understand the published works in an adequate way, if he/she works in research and grasps the scientific bases of the publications. Therefore, a good physician needs research experience. Please do not hesitate to join us in our department. Autoimmune diseases are well-known to be regarded as intractable diseases. Our clinical practice aims to develop the “Novel therapeutic strategies” and hence, precise understanding of the pathogenesis of autoimmune disease has become our goal. To achieve the goal, we are continuously engaged in research. The basic research in nephrology is divided into 3 groups: Polycystic kidney disease (PKD) research group, Renal hemodynamic study group, and Vasculitis group. In addition, we investigate the effect of modified Ponticelli regimen in the treatment of membranous nephropathy. We are also involved in clinical research, together with members of the diabetes/endocrinology group, evaluating the effect of Irbesartan on vascular endothelial functions and renal function. We are vigorously conducting research on 3 themes: “Obesity and Arteriosclerosis research group”, “Pancreatic β cells study group”, and “Endocrinology study group”, which are aimed to be applied on clinical practice. We are also participating in numerous clinical studies related with diabetes, endocrine and metabolic diseases. We make efforts to become one of the unique sources of information in diabetes and endocrine diseases. In our department, we support female doctors in balancing both career and family. Further, we give a special value to practical English education to develop adequate English skills that are necessary for communication, comprehension, presentations at academic conferences and submission of doctoral theses and manuscripts. Therefore, all graduate students in our department will have the chance to upskill in English. During junior residency, residents will learn not only internal medicine but also all the medical subjects required for the national licensing exams. In addition to gaining abilities to address primary emergencies and make a diagnosis of patients’ complaints, residents will also be guided to medical records. Further, since consultation between departments is necessary, residents will learn how to write referral letters and case presentations. Residents will receive a full training on all the basic techniques and knowledge to be doctors. After being assigned to a specific group, residents will have to take care of patients, understand patients’ condition, make clinical case presentations and consult with other departments. When treatment is needed for patients, residents will practice under the guidance of a senior physician. Hence, residents have opportunities to accumulate a variety of experiences in medical procedures in our department. To become a specialist, experiences in all fields of internal medicine are needed to broaden residents’ clinical experience. We recommend residents to practice in local hospitals which treat common diseases including pneumonia, heart failure, as well as cancer. It is our tradition to have a great passion for education, therefore, even in a local hospital, residents receive full guidance from senior doctors. To be an attending, residents are trained the diagnosis and treatment of patients, and according to the characteristics of the hospitals, residents will be trained to specialize in gastrointestinal diseases, autoimmune diseases, kidney diseases or diabetes. After returning to the university, residents could practice in the group they belong to. For students or residents who are considering practicing as junior/senior residents, the application for observership in our department is available anytime. There are no restrictions on the duration of observership, it is flexible even from half-day to a week. Please feel free to contact us anytime. You are welcome to contact us if you have any comments of questions.